The 9398 4×4 Crawler, around $200 when I bought it, and it looked great on the shelves at the shop. A little expensive? Not really, it comes with 2L motors, a Servo motor, a battery pack and the signal receiver with the controller. Plus another 1,321 pieces. The set comes in a big grey box, containing many different bags filled with bricks, the building instructions, and nothing more. It’s definitely not the box of the 42056 Porsche 911 Gt3. Building 9398 you start with the chassis – as always in Technic sets – adding the two L motors for power to all four wheels and the Servo motor for steering at both the front and back of the vehicle. However after a time you’ll notice that the gear ratios are aggressively slow, which some builders won’t like, and for such a big set there is no V8 engine… in fact there is no engine at all! Even the little 8256 set has an engine! If mechanical functions are your thing then unfortunately 9398 will prove disappointing. As I write, just one month after 41999 was released, these change hands, sealed, on eBay for around £350; or nearly three times RRP. Many are being bought by the same UK-based buyer (not me!) in the hope they’ll keep climbing. The box is pretty special. A simple, elegant design on the front showing a close-up of the distinctive dark blue panels that so lift this model; it’s made of sterner stuff than usual, too. Inside this treasure chest it’s fairly tightly packed with lots of good stuff; enough for a few hours of leisurely, pleasurable building. LEGO’s own 4×4 Rock Crawler 9398 (previously revealed here on TLCB) is a thing of, well – not beauty, but engineering excellence. However Lego fans have been rock crawling for far longer than LEGO, so it’s time to feature another fan-made 4×4, this time from Martin H on MOCpages. Complete with the usual array of Power Functions motors and remote control receivers, Martin’s off-roader also features some huge shocks and balloon tyres to help when the going gets rough. See more, including a video, at the link above. One of the stars of 2012 was LEGO’s own 9398 4×4 Crawler, in which Power Functions are put to their best use ever; Truck Trial Off-Roading. 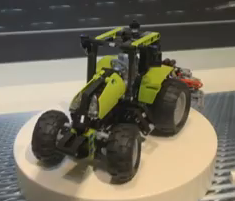 LEGO have since been running a competition to re-body their 4×4 Crawler chassis, with views to making a spin-off set. One of our Elves found this splendid example on Brickshelf. Jerryp has gone for an A-Team-ish flavour with his 4×4 Recovery Van, complete with a working remote control butterfly under-lift in addition to the standard Power Functions 4×4 drivetrain. See the full gallery at Jerry’s Brickshelf page. Back in March we fired up our highly complex supercomputer and attempted to calculate the prices of the three Summer 2012 Technic releases. These new Technic models are now on sale at the Lego Shop, and we’re pleased to say our supercomputer was a) fairly accurate, and b) the small variance is a positive one; all three LEGO sets are exactly £10 less than our March estimates – how’s that for consistency! So what are you waiting for? Head on over to Lego.com and get your hands on LEGO’s latest, all with £10 off! There is some discussion on the internet estimating the prices for the three as-yet-unreleased Technic sets of 2012. We thought we’d weigh in with our predictions, following our previews of all three sets earlier in the year (type ‘preview’ into our search feature at the bottom of the page to read the reports). We were deliberately vague with our pricing information until now, which probably hasn’t helped those of you trying to work out how much to save! So there you have it – some completely unofficial and possibly inaccurate prices. Have we got it right? – Add your views in the comments. In the words of the late Etta James; At Last. After a long search The Lego Car Blog Elves have scooped the final unrevealed Technic set of 2012. 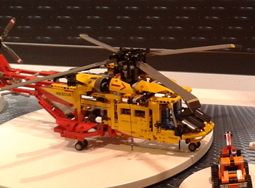 Alongside the previously revealed 9398 Rock Crawler and 9396 Rescue Helicopter, 9393 looks somewhat less impressive, due in most part to the fact it is, well, less impressive. But that’s not to say it isn’t a good Technic set. 9393 is probably the smallest ‘proper’ Technic set to be released in 2012, holding that position jointly with the Quad Bike that’s already in shops (we can’t really say the mini-crane and mini-Unimog are proper Technic sets whatever The Lego Company labels the boxes). Anyhow, this tractor looks a strong starter set, bringing back proper functionality after some shaky efforts over the past few years. It appears to feature hand-of-God steering and a working rear implement, presumably operating as a power take-off from the rear wheels. What we’re less keen on is the laziness of Lego’s designers, as this is the third green Technic tractor in about 5 years. Still, if it’s a popular format then we can understand Lego’s reluctance to break with a winning idea. The 2012 Tractor will reach stores towards the end of Summer 2012 (or August if you’re reading this and wondering what the seasonal timings are at The Lego Car Blog Towers), and should be priced at about one third of the flagships’ RRP. The Lego Car Blog Elves have been spying, and can shed some further light on Lego’s largest known Technic release of 2012; 9398 Rock Crawler. Since the release of Power Functions a few years ago, Lego fans have been making use of the IR parts to add remote control functions to their creations. We’ve featured many such models here in the blog, and it seems Lego would like a slice of this pie too, taking inspiration from both the Truck Trial scene and RC vehicles posted online. 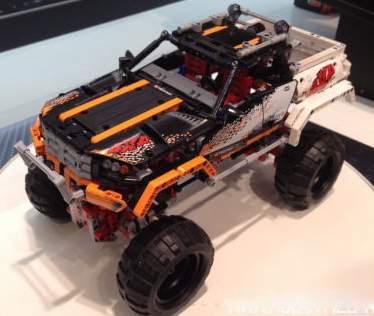 9398 is the first remote control wheeled vehicle from Technic, using Power Functions for 4×4 drive and 4-wheel steering. It also features the portal axels debuted on the 2011 Technic Unimog, pendular suspension and host of new pieces previously unseen. With a release date of Q3 2012 we have a while to wait before we can get our hands on it, but from what we’ve seen so far, this could be the new Technic flagship.